Strategic Leader is fast becoming the new standard for 4-quadrant supervisory leadership assessments. This modular training program is easy to use and enables anyone to quickly and effectively teach managers how to become better leaders. Participants take the assessment and conduct exercises to learn their own natural leadership style, learn new leadership styles and learn how to appropriately choose the correct leadership style for any given situation. Trainers appreciate its simplicity combined with extensive support materials that are available. Everyone prefers the lack of burdensome certification requirements as well as the lower costs. Managers and supervisors like the emphasis on teaching the appropriate use of the four styles. The case-based scenarios used for scoring will look familiar and relevant to managers across all industries and company sizes. Strategic Leader uncovers managers preferred style as well as how likely they are to be able to comfortably shift between the styles. The assessment also provides you with each case’s “ideal” response, allowing for valuable instant feedback. 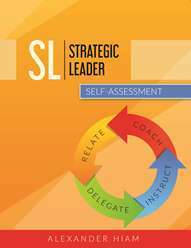 In addition to the assessment The Strategic Leader program offers an instructive Facilitator Guide, Extended SlideShow with embedded video,Training DVD, and Participant Coursebook. Everything you need is included to quickly get your managers to become better leaders. The Strategic Leader DVD. Add to your Strategic Leader training program with this great new 18-minute DVD program. Cover all the concepts and implications of the Strategic Leader process either in a classroom or self-development setting using this great new DVD.